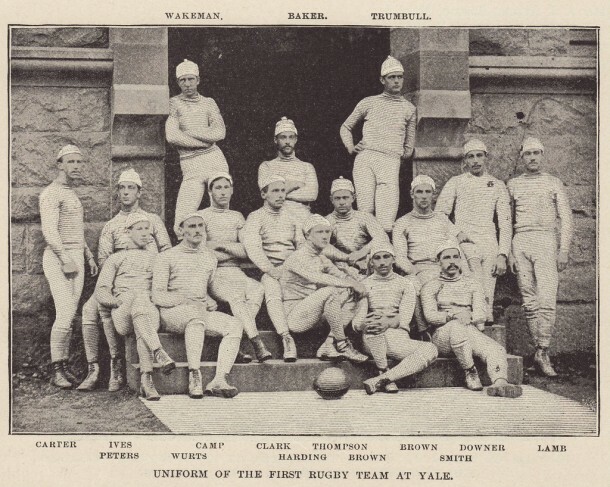 On November 13, 1875, Yale and Harvard wore the first team uniforms in an American intercollegiate football game. This represented a significant departure from custom at a time when team mates typically took to the field dressed in mismatched gear. Then a hodgepodge of soccer and rugby rules, early foot ball took inspiration for its attire from the first American rugby uniforms. These consisted of long trousers tied at the ankles, a jersey, and a toque or a brimless close-fitting hat. The long trousers evolved to knee breeches or pants that fit more tightly to the skin, and at that first Harvard-Yale match, Yale wore dark pants, blue jerseys, and yellow hats while Harvard sported crimson knee breeches, shirts, and stockings. Played at Hamilton Park in New Haven, the match was also the first time these schools met in what has become an annual rivalry. 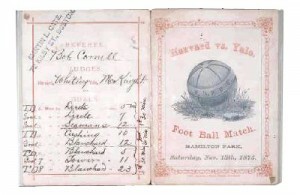 Yale guaranteed Harvard $75 to play and with tickets selling for 50¢ each 2,000 spectators filled the park. Following modified rugby rules, each team fielded 15 men. Harvard won 4-0 amid the endless protests of the players, spectators, and officials over the rules. 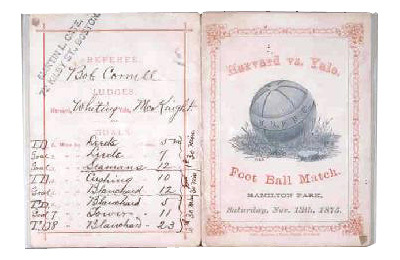 Harvard and Yale agreed to play the next year’s game under the Rugby Union rules, and by 1876 Princeton, Harvard, Yale, and Columbia had organized the Intercollegiate Football Association.